Are there ever 'answers' and the problem of truth. It was once said of Bertrand Russell that you may not agree with his arguments but you always knew what it was he was arguing about. In a paraphrasing of this position an aim in this work is to ensure first that the questions and issues are clear and precise. Theoretical physics is a respected discipline. Yet theoretical social science is yet to emerge as a discipline at all. The physicist immerses his or her self in the core tools of the discipline, slowly reaching a proficiency and insight enabling original contributions. What are the core tools of a theoretical social science? Are they statistics? Throughout my involvement with psychology and human development I have always seen the use of statistics as an escape from wrestling with the actual problems of theory construction. The relationship between theory and statistics I have always seen as follows. Imagine a set of datum as below. And imagine some statistical charting of a line through the points to give a best possible fit. It is tempting to see the 'theory' as the line through the points. I always saw the theory as the box that contained all the points and explained the position of each without resorting to statistical methods. This position is not argued as a philosophical position, rather it was and still is a frame of mind. An orientation to the issues frequently encountered in social science and the assumption that the diffuse nature of the data hid the 'real situation' which was uncovered with statistics. There was some philosophical views underlying the position to the extent that I believed, or certainly suspected that the spread of data inevitably encountered was in fact real. This of course implied that each point was a unique instance of a theory of a much broader nature and scope. It also means that any statistical relationships are of unique observations, and, any averages or means, merely relating to this particular set of data under these particular circumstances and having no general validity. The problem was how to create such a theory? This question pre-empting any concern with a theory of psychology or society. The precision sought is of three types. First, preciseness of the variables used. It is far from simple to achieve this precision. Fundamental issues such as "what is a variable?" quickly overpower the obvious issues such as how do we distinguish between dependent and independent variables? 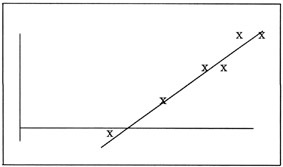 Second preciseness of the relations between variables. In physics this is taken for granted and managed broadly within the rules of mathematics. It is far less obvious in social science where too often diagrams are offered where the variables are ill defined and the arrows between the variables not defined at all. Third, and finally, what is sought is a fundamental base to the whole process of theory creation. In the sequence: reality -> perception -> creation of knowledge -> conceptualisation and theory creation, each step is understood and defined such that each step builds on the one before in a defined and understood manner. There is to be a linear progression beginning with the most fundamental position possible. This does assume that this is a valid sequence, not a fixed or rigid sequence, but if we are seeking explanation of some reality beyond knowledge, then this sequence has a crucial part in the process. The concepts emerging from the reflection above must be of a standard such that they are science and not philosophy. Accepting at this stage that science itself is to be defined in the process, but accepting for now the broad notions of science in terms of conceptual precision and empirical validity not typical of philosophical discussions. At one time the study of the nature was philosophical, then was absorbed by chemistry and physics. Human nature and society were themselves philosophical subjects then absorbed by psychology and sociology. Part of the task of this book is to shift epistemology from a philosophy to the beginnings of a science, showing how it is part of the study of our cognition, and providing an initial system of concepts having the precision and fundamental structure of science. The final comment on the search for precision is on the method. The circularity outlined in the earlier section took many years to unravel as the reflections first sought a theory of psychology, then one of knowledge, then a solution to the problem of cause, until finally understanding of the intertwined nature of the issues dawned. How to break this cycle? It simply was not possible to begin in one place and move systematically forward secure on that left behind on each step forward. This, because the answers at one step influenced the options and answers at all other steps. So one could not be sure that the solution to the issues being wrestled with, say the problem of the knowledge, would not alter the problem that was thought to be resolved, say the theory of psychology. The process adopted was iterative. That is, to create some set of solutions then work them around all the questions to see if the solution did fit together to form a coherent whole. When examining a solution, the frame of mind was questioning. Each time the process was completed, more had been learned of the details implicated in the system of problems and the details that had to be addressed by any valid solution.